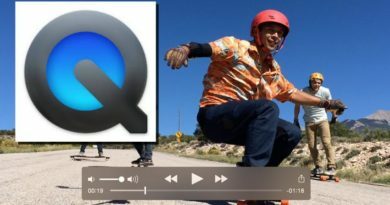 Outline: Have question on free copy DVD movies to Android tablets or smartphones on PC or Mac? Now I answer for you! Just rip DVD movies to Android supported formats, and then transfer the movie files to Android via USB or other ways for flexible playback . Usually, you can’t have internet access all around, whether you are travelling or at home, so copy and move your DVD library to a Android Tablet or Phone is a good choice. Plus, a good Android video player app can turn your Android phone or tablet into a mini theater. However, whever Android tablet or smartphones don’t have the DVD drive for playing DVD movies. That means, if you want to free play DVD movies on your Android devices anytime and anywhere you like, you will need to rip DVD to Android compatible video formats. Android accepts various video formats, like H.264, MPEG-4, MP4, WMV, AVI, MOV, 3GP, etc. So a DVD to Android ripper is badly needed. You can search the related key words on line, and many results would be available. However, most of the DVD to Android rippers/converters are charged, and you have to figure out whether the one you choose pays off. If you want a fast, effective, and fairly user-friendly DVD-ripping solution, Aimersoft DVD Ripper and Leawo DVD Ripper are the way to go. They carved a niche market out of the powerful and complete DVD backup and DVD conversion products, rip DVD movies to Android smartphones or tablets compatible video files with fast ripping speed and excellent output video quality. What’s more, some video editing features like trimming, cropping, rotating, adjusting video effects, etc. are provided to customize your videos. Search and embed DVD movie information. Supports almost all popular mobile devices like iPhone, iPad, iPod, Samsung, Amazon Kindle, Nabi, Hudl, Surface, Google, Nokia, HTC, LG, Sony and more. Mac version DVD to Android ripper is also available. 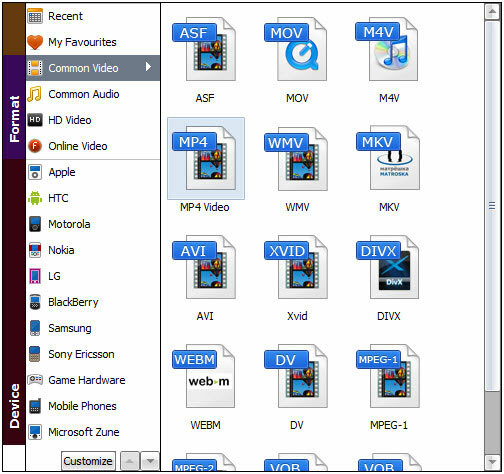 If you choose a right DVD Ripper for PC or Mac, DVD to Android ripping can be very easy. Take Aimersoft DVD Ripper made for Android for example. First free download this DVD to Android ripper, install it and run it when you want to start ripping. How to Rip and Copy DVD to Android Phone and Tablet with Proper Parameters? Click “Add” button to load DVD Rom, DVD folders, ISO files or IFO files respectively. As you can see, added files can be previewed on the right viewing window and you can take snapshots of the movie scenes you like freely. Step 2. Select the Android support video formats. Click the pull-down menu in the “Profile” option to select the output format. If you want to play the DVD movies onAndroid phone, you can select “HTC” > “Android OS” as the output format. If you want to watch DVD movies on Android tablet, you can select “MP4” from “Common Video” or “HD Video” or choose the icon of your device as the output format. Optional – If necessary, you can adjust aduio/video parameters, for example bit rate, frame rate, resolution, aspect ratio, sample rate, channel to output a better effect of images/audios. Click “Start” button on right bottom of the main interface start the conversion. When then conversion finishes, click “Find Target” to locate the ripped DVD movie files, Then you can transfer photos, music, and other files between your computer and device using a USB cable. 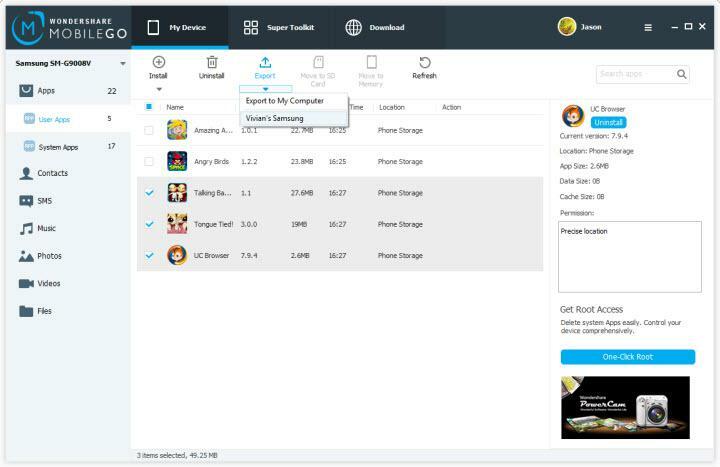 You can also transfer files from your device to a computer. To transfer media files, Android File Transfer must be installed on your computer. Android File Transfer is compatible with Mac OS X 10.5 or later and Android 3.0 or later. If you think that use USB cable to move files between your PC/Mac and your Android devices is a waste of time, and you also wish you could easily send photos and files between Android devices? Please read the following a easy ways to move files between Android devices, as well as between Android devices and your computer. MobileGo is your one stop solution that lets you manage your entire mobile lifestyle in one convenient place. It allows you to wirelessly connect more than one Android phone or tablet to the PC, so you can easily move video, music, apps and photos between Android devices. What’s more, it supports almost all Android phones/tablets and iOS devices. Free up space and more on your devices. Entirely back up any Android device you connect to your computer through the software. Transfer these files mentioned above from the Android device to PC, and vice versa. This software also works with USB cables, so you can also manage the Android devices without the use of WiFi if you are willing to connect the USB cables. 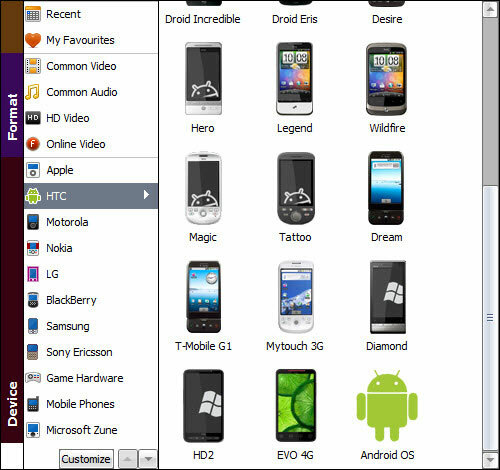 Step 1: Download and open Wondershare MobileGo for Android on your PC. Select “Connect new device”, so you are provided with a QR code. 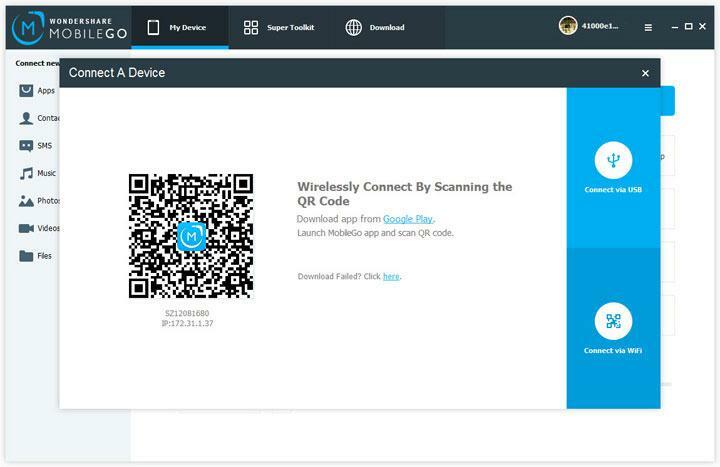 Step 2: Open a QR scanner app on your phone or tablet, and scan the code on the computer in order to connect your device. Step 3: Accept the request pop-up to allow connection on your PC. Step 4. Once connected, select from the drop down menu whatever you want to export to your Android device. As I mentioned above, Wondershare MobileGo enables you to transfer apps, photos, music, video, photos and documents between Android device and PC. There are also many apps that are available to wirelessly transfer photos, video, music files between Android devices and PC, but almost are unstable and are complicated to use. In addition to this, you can also transfer media files over Bluetooth, althought much slower and only allows small file transfer, however it is a free way. Now you can choose a good Video player on your Android Phone or Tablet for play DVD movies. How to Choose the Best Video Players for Android Tablet or Phone? And so on. Welcome to share your methods. Now, pick up your Android phone or tablet free to enjoy DVD movie! How to View 3D Movies with Gear VR on Galaxy S7/S6 (Edge) or Galaxy Note 4/5 through Oculus Cinema? ← How to Play Movies on Galaxy S7/S7 Edge(DVD, iTunes, 4K and HD Video)? I want to play DVD movies or videos on my Android device which doesn’t have a DVD drive, such as a Android smartphone. For this reason, Aimersoft DVD ripper can be quite handy as a means of backing up my precious physical DVDs to my hard drive or elsewhere and as a way to convert my DVD movies into a format playable on other devices. I have some Disney DVD movies, I want to transfer them to my Android Tablet for playing with my family. But I tried several times for watching smoothly on my tablet, both ends in failure. Later,I am suggested to rip and converDVD movies to MP4 using Aimersoft. Everything for the conversion goes quite smoothly for me! Aimersoft DVD ripper accepts DVDs, Folders or ISO files as the source. It is designed to rip DVD to MP4 and AVI, ect., Itis also easy to convert DVD to fit the Android device specifications. 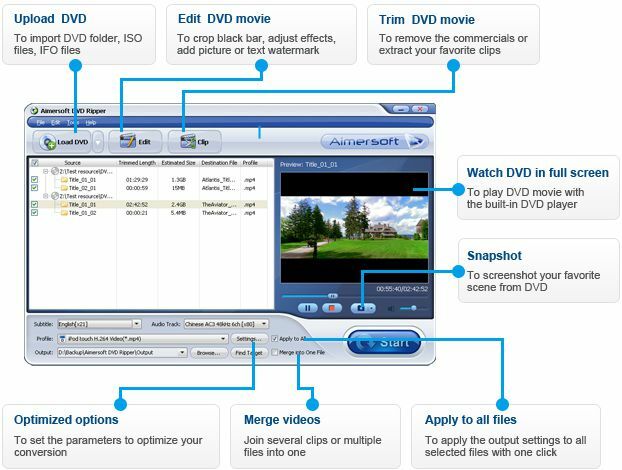 Aimersoft DVD ripper can well satisfy me with DVD to video/audio conversion needs. Aimersoft DVD Ripper is not simply the decryptor and the ripper. It functions very well in the various parameters of the DVD file format like the bit rate of the audio as well the video format, the frame size, resolutions and cropping various frames with the DVD. It guarantees not to tamper the quality of the original DVD. It actually produces a better one indeed. It has the batch conversion option for a faster speed. It is actually a good deal to get. This program is very user friendly. As soon as I uploaded the DVD to this program it instantly converted the file to mp4 within a few minutes. Easy tool to use to convert your dvd and dvd iso files into mp4 for playing on my Android phone. This is such a nice great solution with lots of good information. Powerful awesome program! My experience with the trial versions is Great! I’ve tried all functions.